In our previous blog post, we took a look at the championship points chase in the GTL class of OPTIMA's Search for the Ultimate Street Car, presented by Advance Auto Parts. In this blog, we'll take a look at the hotly-contested GT class, in which Chevrolet Camaros have been a dominant force. The GT class is the largest and most-competitive in OPTIMA's Search for the Ultimate Street Car. This class features multi-time OUSCI champion Danny Popp, who is so good, he's also in the top-ten in the GTL class in a different car and Ken Thwaits, who is so good, he has already qualified three different cars. As good as they are, neither of their Camaros is leading in the points chase. That honor falls to Bryan Johnson, who holds an edge of almost 16 points over Popp in his 2013 Camaro. Bowties seems to dominate this class, even with Ken Thwaits throwing out a $3000 bounty for the first newcomer in a Mustang or Challenger that could beat him at an event. Four of the top-five competitors drive Camaros and seven of the top-ten. This class also has no shortage of competitors (seven), who have already qualified for the OUSCI. 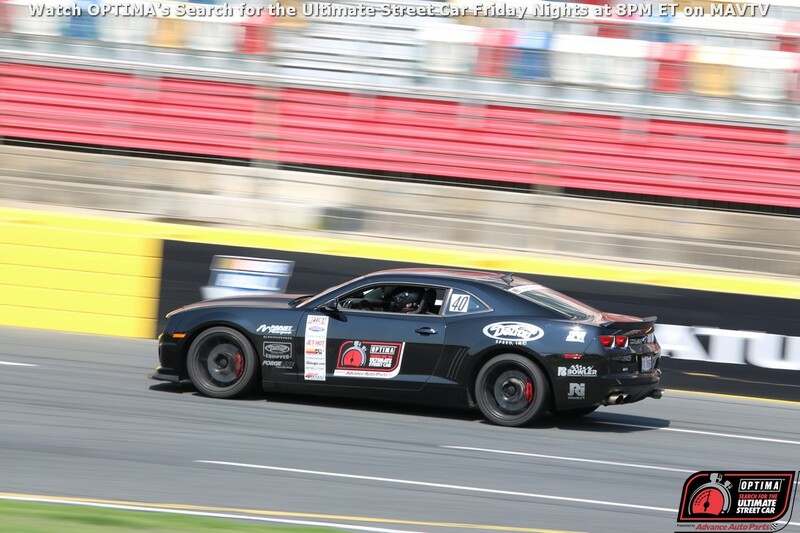 Jeremiah Stotler owns the only Mustang to appear in the top-ten and he sits in fifth place, having picked up the OUSCI invite for his sixth-place finish at Charlotte, because the five GT competitors in front of him have already qualified at other events. Even though seven of the top-ten in the GT class have already qualified for the OUSCI, the points race remains tight. It is unknown if Johnson or Popp will make the journey West to compete in the final double-points event. If neither run, that leaves the door wide open for a GT championship to be won by as many as five different drivers- Jason Chinn, Stotler, Dannie Pinard, Mike Gallagher or Premo Chandler. While Thwaits has multiple cars to choose from for Vegas, the points he earned have been split across multiple cars, with his black Camaro carrying the most points from Thunderhill, Texas and Charlotte. Since only Charlotte was a double-points event, he probably won't be able to accumulate enough points at Fontana to catch Popp or Johnson. Additionally, with time and distance being what they are, Popp may opt to run his Corvette in the final qualifier as a tune-up for Las Vegas, which could move him up significantly in the GTL standings, but wouldn't put him in title contention. There are a lot of other folks eyeballing the entry list for Fontana right now and speculating about how their points might hold up after the Pike's Peak and Road America events. Let us just say right now that the entry list for Fontana is already at 31 vehicles and we're more than two months out. AUTO CLUB SPEEDWAY WILL SELL OUT! Procrastinate on registering and you will likely end up like the folks on the Road America waiting list, who are hoping someone else's bad luck turns into their good fortune. As the events at Pike's Peak and Road America are run, more competitors will look into scheduling a trip out West for a last-chance qualifier for the OUSCI and a place to store their cars for a few weeks until the SEMA Show if they make the field. We mentioned the tremendous points opportunity available to GT competitors at Pike's Peak the other day and nothing has changed in that regard. Ken Thwaits is still the only GT competitor signed up in the Expert run group and there are fewer than 10 total entries, several of which are in the Novice run group. Everyone in the top-13 in GT points has run at least three events already and the points available in a small field at Pike's Peak could have a significant impact on the overall standings. If Cliff Elliott were able to add 20 points to his season total at Pike's Peak, he'd only move up one position in GT points, but with Saroja Raman sitting on the bump spot for the overall top-15, she would end up on the outside looking in. The difference 20 points could make for someone like ninth-place Premo Chandler would be even more profound, moving him up several spots in GT and two spots in the overall points race, where the top-15 who have not earned already earned invites get their tickets punched for Las Vegas. Some will sit back and watch others battle it out for points in the crowded field at Road America. They'll hope those with OUSCI invites will take points away from those without and that the lead they have within their class or in the overall chase will remain intact. They choose to put their fate in the hands of others, which may work out. If it doesn't and they suddenly find themselves scrambling for a way to get their car to Fontana in early-October, they may look back at the Pike's Peak event as a missed opportunity. Those who want to control their own destiny will sign up for Pike's Peak.